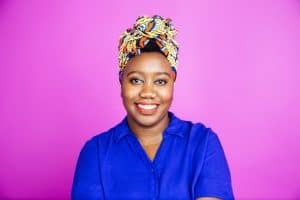 Evelyn Ngugi is an Austin-based video producer and Internet personality dedicated to highlighting the experiences of people of color. She is currently co-writer and co-host of Say It Loud, a PBS Digital Studios series about Black identities and cultures. Through her YouTube persona Evelyn From The Internets, her cultural critiques and humorous takes on somber current events inspire and entertain fans, including Beyonce who featured her Lemonade review on the Formation World Tour. Yes, that really happened.